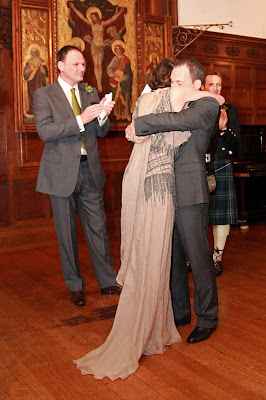 I have finally managed to get my act together with this post - my beautiful sister's wedding back in December 2011. It really was the most magical day, everybody had a fantastic time. The above photo shows the entrance hall where we had pre dinner drinks. The fireplace was lit and the tree was decorated by my sister and I the day before - lots of bargain baubles with the odd little bird decoration here and there. The above photo shows the hall where the ceremony took place. This was also the room where we had dinner. Check out the panelling and the ceiling! The hall had two fireplaces which we decorated with candles, birds, pines cones and pheasant feathers (bought by my sister from a feather shop in Hong Kong! I suppose they don't take up much room in a suitcase). The stairs were just a sight to behold. The night before the wedding, a lady had booked the place for her 50th birthday party - a pantomime themed party - and she placed Cinderella's glass slipper on a velvet cushion at the bottom of the stairs! 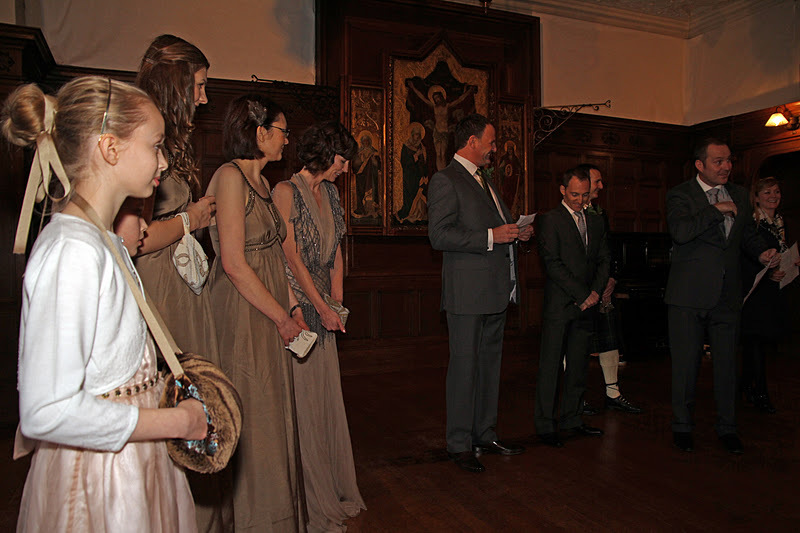 Here's us all lined up - I had sourced some vintage 1930s beaded clutch bags to carry instead of bouquets. My sister's dress was from Jenny Packham and the adult bridesmaids dresses were from Biba at House of Fraser. That's me stood next to my sister. This is my favourite photo of the day. Clare's dress looks amazing, she couldn't have chosen a more beautiful dress. After the ceremony, everybody so happy. Check out the ceiling! Time to eat. The food was delicious and there was so much of it. A dessert platter for each table so people could choose what they fancied. Lemon posset, meringue, chocolate and chestnut pot or fresh fruit. There was also a cake table instead of a wedding cake, which had Christmas cake, Carrot cake, Chocolate cake, Cupcakes, Coffee and Walnut cake and a Gingerbread house. The cakes were all kindly made by a friend of Clare's. Close up of the wedding dress. Stunning beadwork. It was certainly a day to remember. The happy couple went to Norway on their honeymoon and then returned to England for Christmas day. They are now back in Hong Kong where they live but we will see them again at Easter as we are going to visit them!!! We booked the flights last week and we are so excited, although I don't know who is more excited - the kids, me or my sister. An itinerary has already been drawn up so we will have lots to do once we're there. Oh and I'll be able to see the crochet blanket in its new home. Perfect. OMG that might be one of the most beautiful wedding dresses I have ever seen! Anyway - too exciting to be going to Hong Kong. It looks like such a happy relaxed wedding, just my style. I love the bride's dress too, not the usual white meringue, although there can be some divine meringues! I love the beautiful dresses, the venue, everything. When me and the Mister eventually tie the knot, we would love a winter wedding- and your pics just prove how beautiful it can be. Wow - what a gorgeous day and how exciting to be going to visit - WHOOP!! i would LOVE to have a desert platter like that...how gorgeous!